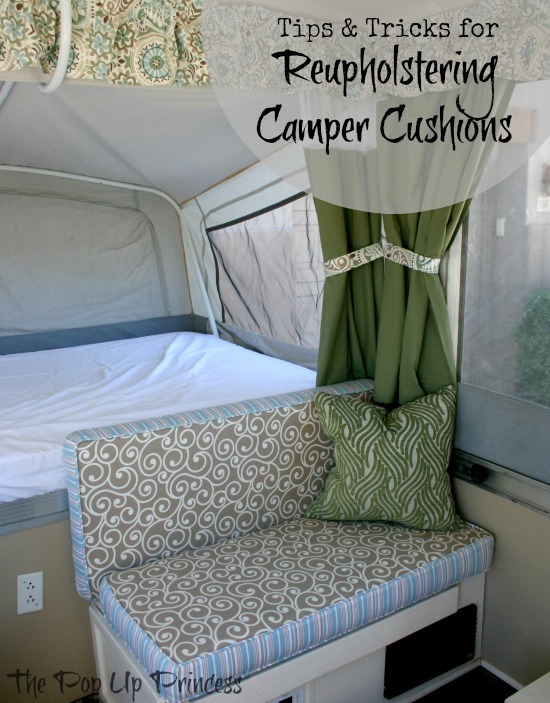 If you’ve read this blog for very long, you’ll know that I have been wildly intimidated by the thought of reupholstering our camper cushions. I’m a decent seamstress, but cushions seemed to be a far more difficult project than I was ready for. I thought about leaving them the way they were, but this is what I was dealing with. Yuck, right? When I was putting together a round up of my favorite pop up camper makeovers, I was really inspired. I wanted my camper to look every bit as nice as theirs did. I just knew something had to be done about the cushions, so I bit the bullet and started planning. Planning, for me anyway, always involves a few hours on Pinterest. 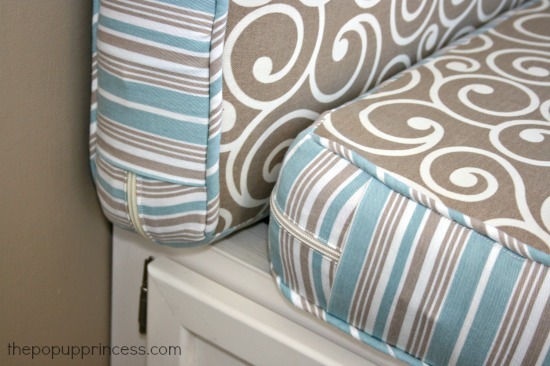 I came across this awesome tutorial for sofa slipcovers, and it was my bible. I made a pattern out of freezer paper, using the measurements of my cushion plus 1 1/2 inches for seam allowances. This made cutting out all of my pieces super simple, and if I needed to adjust anything, I could mark it on the pattern piece. If you have a Coleman camper with the same sized cushions, you should be able to use the pattern above to cut your pieces out. Once my prototype was made, I made minor adjustments to make the cover fit the way I wanted it to fit. The drop cloth version was a little baggy, but the fabric had some stretch to it. I only made minor adjustments because the fabric I purchased might not stretch. If I cut off too much fabric, and the covers were too tight, I couldn’t fix them. I could always make them a little tighter. Armed with my new measurements, I went fabric shopping. I spent the better part of a morning hitting all the fabric stores in my area. I even went to a few upholstery shops. I had really fallen in love with this Better Homes and Gardens outdoor fabric from my local JoAnn, but only one of the stores near me had it in stock–and no more than 2 1/2 yards of it–and I needed 7. I kept searching, but at the end of the day, I really only wanted this print. I went back to my local JoAnn, desperate to make this fabric work for me. When I stumbled upon a coordinating striped print, I knew I’d found my solution. I decided to mix and match my prints. For the side panels, I used Waverly Aran Spa, and for the back, I used a heavy duty brown duck cloth. Here are all my pieces cut out. 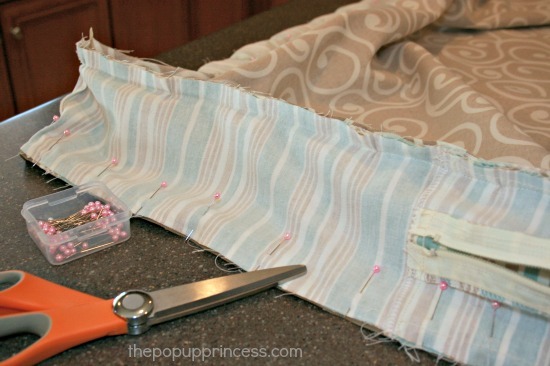 Installing the zipper was surprisingly easy when I followed this tutorial at Honeybear Lane. 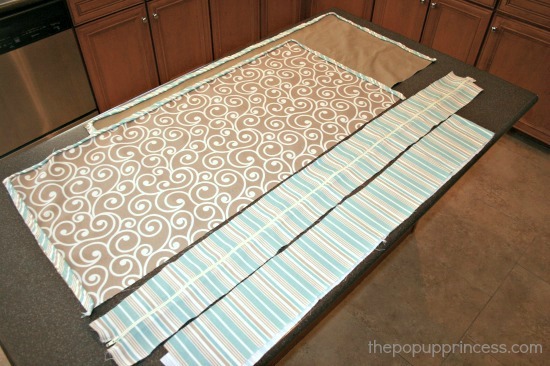 Because I wanted my zippers to wrap around the sides, I used 72″ upholstery zippers, which I cut to the size I needed. You can find them in the upholstery department at JoAnn or you can find them on Amazon here. I opted to make my own piping out of the striped fabric, and I really love how it turned out. I’ve made piping in the past for other projects, and it is amazing how easy it is–and so much cheaper than buying piping by the yard. I followed the Honeybear Lane tutorial pretty closely. She does a fabulous job outlining all the steps, and I never felt confused or frustrated. I was a little shocked when I finished my first cover without a single mistake. Maybe this wasn’t so hard after all. But, no! I spoke too soon. 🙁 Here’s where one of my major mistakes came in… I assumed that all my cushions were the same size because they looked the same size. The bottom cushions, however, are about 1 inch narrower than the top ones. I had three covers made before I discovered this, and I had to spend an entire morning picking out stitches and adjusting my pieces. Lesson learned? Measure all of your cushions… even if they look the same size. On the last cushion, I cut 1 inch off the long side of the front and back pieces, so the bottom cushion measurements were 41 1/4 x 19 1/4. Because I wanted my cushions to be soft and full looking, and Coleman was pretty stingy with the foam in their cushions, I used some high loft batting to wrap the cushion foam. This helped fill out the cover and give it a nice, plush look. Batting is ridiculously hard to coax into the covers, though, so I wrapped the whole cushion in the cheapest fabric I could find to help it slide in smoothly. Then I pulled the fabric tight and stapled it to the particle wood backing. I love the thick duck cloth on the back of the cushion, because it is durable enough to withstand friction from the particle board. I feel like the other fabrics would have become snagged or torn easily. That particle board is rough stuff. Slide your cushion into your new cover, adjust it to your liking, and that’s all there is to it! The batting fills out the cover nicely and gives it a custom look. The covers are really easy to remove for washing (check the recommendations on your fabric before laundering), and using an outdoor fabric gave me an element of stain resistance, too. Best of all, I’m loving the new wrap around zippers. The old cushion covers had insanely short zippers, and getting those cushions out of the covers required a strong arm and a good amount of patience. I actually cut the last cover off because I was so sick of wrestling with it. The new covers have these wrap around zippers with a hidden pocket for the zipper pull. I love how easy it is to remove the cushions, and the zipper pull isn’t an eyesore. What kind of fabric do you recommend for curtains that shakes out wrinkles well? I happened to be using a medium weight Linen look Polyester for my curtains. Polyester really doesn’t wrinkle but it can be a pain to sew since it slides all over the place. Lots of pins used to keep it all straight even when cutting. The linen look gives it a drapery feel, although I think this fabric was originally meant for suits or pants. The camper really looks great!! 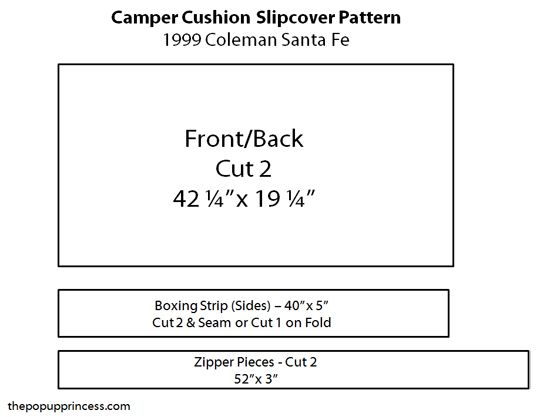 We just bought a 98 Coleman Cheyenne and I have found a lot of the changes you have made to your camper are things I would like to do to ours – including reupholstering the cushions. I was wondering if your seats had the little stoppers to keep them from sliding off the bases when you are sitting on them? And if so did you just install them back at the end? Tracey, We didn’t have any stoppers on ours… ??? I don’t know if we just never had them or if the previous owner removed them. How do they attach? Do your seat bases slide without them? I redid my cushions and those little stoppers are impossible to find! Also, did you recover the couch cushions? That project seems much more difficult to me! I think our stoppers must have come out, because we didn’t have them in our cushions. We haven’t had any problem with the seat cushions sliding around, though. Coleman Pop Up Parts has cushion stoppers. Are these the ones you are looking for? We don’t have a couch in our camper. We have a long storage cabinet instead. What seems difficult about the couch cushions? Are they the ones that are rounded at the top? Larissa, what is that black box under your dining bench seat? Heater? put a large strip of velcro on both the seat and the cushion. My camper has that and nothing slides around. 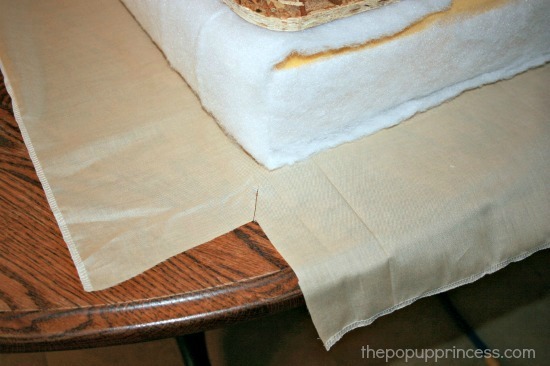 Was the particle board already part of your cushion originally and you just decided to keep it? My husband and I are renovating our pop up but our cushions in the dining area don’t have boards on them. I’m trying to decide if I like the idea of having the hard side on one side. 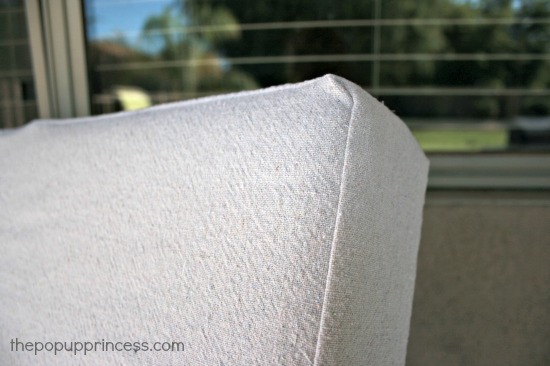 Did you cover the particle board all the way around with batting or are the back of your cushions just hard? How did you do your piping? I’m in the middle of cushion #1 and I can’t figure that part out! Lol! Any links on how to do it? Thanks! Gorgeous!!! What a wonderful change from the original cushions. I made the cushions and I also made a cover out of muslin and then made the covers.. I wanted it to be comfy and not feel the foam, which we should have added batting, but didn’t want the extra expense (we have spent too much on little things and they all add up). 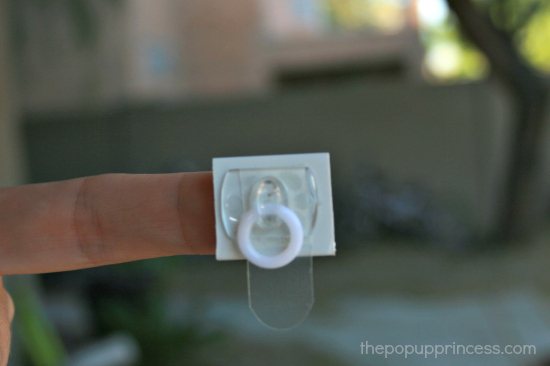 Attach the rings to the curtains, the clips to the plastic sliders (which stay ON the track). Hope that helps. First of all GREAT JOB and an awesome tutorial!! I love your end results!! My husband and I are about to embark on a camper re-do with a 2004 Fleetwood Utah, fingers crossed! 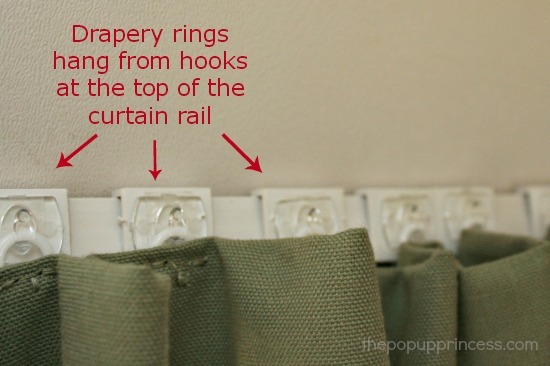 How did you re-attach your drapes? 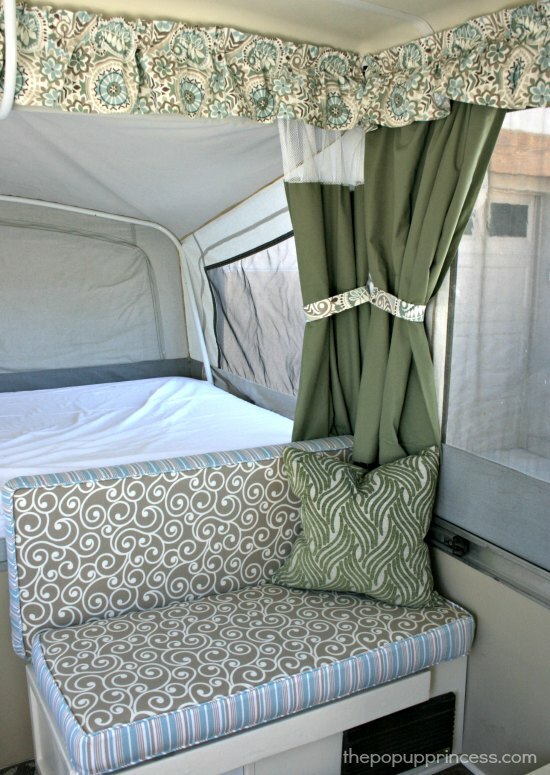 I am going to sew new drapes for ours and the existing ones are attached with plastic clips that hook on the metal “track” around the perimeter of the camper. Were yours the same, and if so, how did you attach them to new fabric? Also, do you remember what weight/fabric blend you bought for the drapes? Thanks for your time on any advice/suggestions you can give! Thanks, Cyndie! It’s been a lot of fun. Our drapes were also attached to a track with little plastic clips. I didn’t attach the plastic clips back to the drapes. I mounted them on the track and attached a plastic Command clip to each one. Then I sewed the plastic drapery rings to the panels. Now I just hang the rings on the clips when I set up camp. I like to take my curtains down before I close up the camper, because I am picky about them. I like to keep them clean. But on our long two week trip, we kept them on between each leg of the trip. I took them down at the end of the vacation to clean them. Make sure to send me pictures of your remodel! I’d love to see what you end up doing with your Utah! Hi! I love what you’ve done to your trailer! You’re so clever!! I do, have a couple questions. We have a Coleman, a couple years newer, and my first issue is the valance. In your pics, looks like you replaced them, their gorgeous BTW, but mine are sewn onto elastic, and then they used a slider contraption that fits into the track. Is that like yours? And how did you deal with that? And how did you figure the fabric calculation. Mine are in separate pieces, and even tho I’ve been sewing longer than I’ve been driving, I’m at a loss. Second, what/where did you find the ring thingy you use to hand the curtains? Product name, code, etc would be great info. Thanks!! Nora, thanks for the kind words. It was such a fun project. I do have an entire post about the curtains and valances, and you can find that here. We used glide tape, which you can see here, for our valances. I measured each valance, multiplied it by 1.5 to account for gathering, and used that measurement to cut the panels. 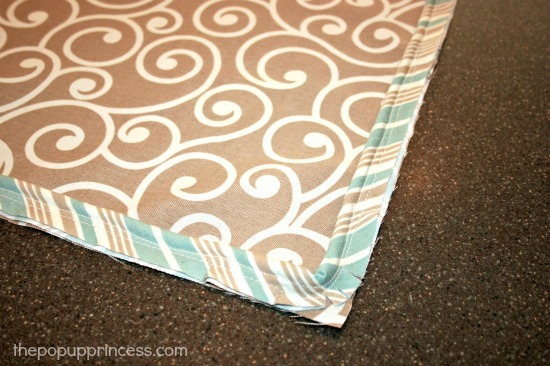 I gathered the valance first, then I sewed the glide tape to the back of each valance panel. Here are the drapery rings I used for hanging the curtain panels. I used these clear hooks from 3M and attached them to the plastic curtain tabs. The tabs still glide along the track; the curtains just aren’t sewn to them anymore. I wanted to be able to remove the panels easily for laundering. Love the new look! Did you prewash and iron the fabrics before you cut them? Thanks for a great tutorial. Hi again! So I’m finally working on my reupholstering project for our camper. I had to teach myself everything about how to use a sewing machine and I’ve successfully pulled off a practice zipper and practice piping from the links you placed in your blog. Now I need to put it all together. I was looking at your diagrams for the pieces you used and noticed the two zipper pieces. I’m assuming you made the piece with the zipper from the tutorial you linked to and the other “zipper” piece is actually whole and what you put on the opposite side of the zipper. The pattern is a little confusing for me (probably because I’m not fluent in sewer-ese)…both of these you cut the same size but in the picture the one with the zipper is longer and the other side is obviously covering the point where the zipper is hanging. Can you put a few more pictures up with a little explanation, if you have time, please? Also, what are boxing strips? Are they the striped fabric that is already attached in the picture where each piece is laid out separately? How does the piping attach? Do you attach it before putting the entire piece together? Can you tell me in what steps you sewed everything together? Did you use a sewing machine for the entire thing or were there points you needed to hand stitch? Do you have any suggestions for someone who is doing this as her first every sewing project…other than “STOP! Stop immediately! You are crazy! Why?! Why would you ever do this? !” I already covered that and it’s not an option. Thanks so much! I hope to actually do a decent job and be able to submit pictures to you by/before June! Wow! Lots of questions here, and I’m not sure I understand everything you are asking. I’ll give it my best shot. 🙂 First off, as I suggested in my post, I would HIGHLY recommend you sew yourself a prototype out of cheap material before you cut up your pretty stuff. If you are a beginner, this is a pretty hefty first project. You’ll make mistakes. Make them on the cheap fabric first. Second, the boxing strips are the pieces that go around the sides (they are the striped pieces in my cushions). They make your cushion cover into a “box” essentially. You have your front piece, your back piece, and your sides. It differs from an envelope type cushion cover, in that you have an actual side piece. You have two zipper pieces, one for one side of the zipper, and one for the other. Once you have inserted your zipper into your zipper pieces, you have essentially made another boxing strip. You’ll sew all your boxing strips together to make one long strip for the sides. I cut all my pieces, sewed on the piping, and put it all together by attaching the long boxing strip (made from the boxing strip piece you cut and the one you made with the zipper) to the front piece and then the back piece. Make sense? Your pattern for the boxing strips say two cut 2 or cut once on the fold. Would the fold go on the short side or the long side? Hmmm… I’m not sure I understand what you are asking, Elisa. 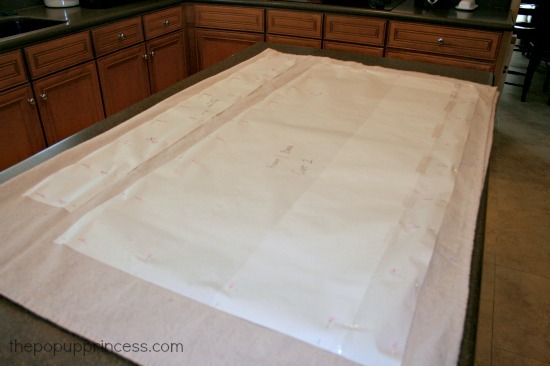 You basically want your boxing strip to be 80″ x 5″ so if you cut the 40″ pattern piece on the fold, you’ll get that length. I’m just starting this (Scary) process, I have the same “lovely” cushion covers (aka eye sores) that you had! My question is about the curtains. 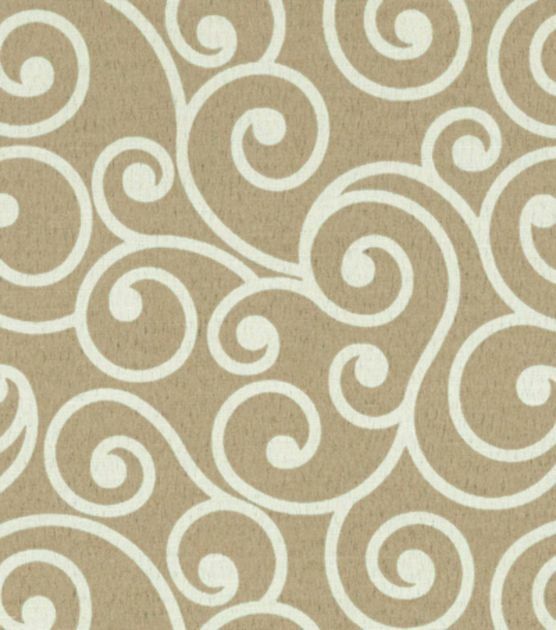 I bought some fabric shower curtains because I loved the print, plus I figured (hoped) the since made for a steamy shower the fabric wouldn’t wrinkle and would tolerate life on the camper well. Did you just sew the new fabric on top of the existing fabric or start over from scratch? Hey, Kim! Thanks for dropping by. Are you using the shower curtains for cushion covers or curtains? I made both from scratch. The only things I reused from the curtains were the plastic slider tabs and the mesh panels from the privacy curtains. My curtains were pretty trashed, so there was no reusing them. I didn’t bother with keeping the cushion covers either. I threw them away–actually they were wedged on so tightly, that I had to cut a couple of them off. They were ugly and smelled kind of funny anyway, so no big loss there. When I say my whole camper got a makeover, I’m not kidding. We didn’t keep much of the original stuff. Larissa, I’m not the best seamstress. Do you think I could sew these and velcroe them onto the old cushions? I’m pretty sure I couldn’t put in a zipper. We have a 1997 Coleman. I love your site. I’m looking forward to trying to spruce our camper up. If you aren’t confident in your sewing abilities, Mary, you’ve got other options. I have seen where people wrap their cushions in fabric and staple it to the back. 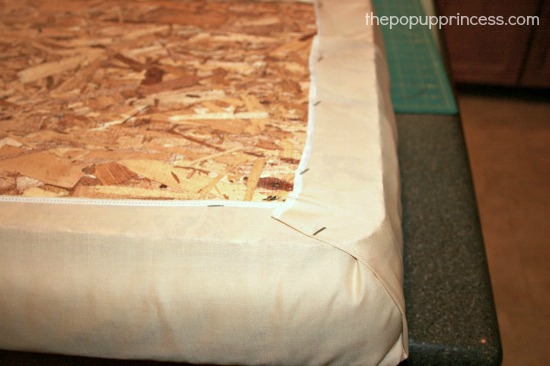 If you have hard plywood backs on your cushions, this would work for you. And Jody at Because I’m Me made envelope covers for her cushions. If zippers intimidate you, that might be an option, too. You can check her cushions out on this post. I’ve been wanting to redo my cushions on my 2004 Fleetwood Pecos pop-up trailer. I finally went two days ago to choose fabric samples before going hog wild. I came home with several samples from Joann Fabrics. I just looked up on Google and you popped up…low and behold we picked the exact same materials for the cushions. I’m a little freaked out right now. You cushions look very nice. I have a travel trailer whose cushions are quite different, the seat and back portions are one piece with a “hinge” of fabric between. Do you know of a tutorial that addresses that? Mine are in desperate need of recovering. Thank you. WHAT A GREAT TUTORIAL! I HAVE BEEN WANTING TO RECOVER MY CUSHIONS AND THIS WAS MY SPRING BREAK PROJECT. RECENTLY I REPLACED ALL CURTAINS, DRAPES, AND VALENCES. THE UGLY FABRIC ON THE CUSHIONS WAS MAKING ME CRAZY. I WENT WITH DENIM AND MADE MY PIPING. I WAS A LITTLE NERVOUS AS I SKIPPED THE STEP TO MAKE THE PROTYPE. I WILL BE PURCHASING MORE CUSHION STOPS AS MINE ONLY HAD ONE EACH. I THINK I ALSO MAY CHANGE OUT MY LIGHTING FOR LED. THANK YOU FOR TAKING THE TIME TO DETAIL THESE AWESOME PROJETS. HOW DO I POST A PHOTO TO SHOW YOU? Larisa, what type of fabric did you use for curtains and valances? outdoor? cotton? 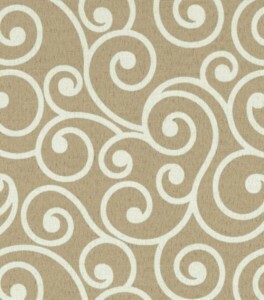 I found some outdoor fabric that i like but even with 50% off i would have to hide the receipt from hubby! SO GLAD I FOUND THIS SITE – BEEN TRYING TO GET UP THE COURAGE TO RE-DO MY CAMPER CUSHIONS AND NOW I THINK I CAN GET STARTED! THANKS! Looks great! I am following your instructions and starting on mine today. How long is the zipper you used? I bought 45″. Oh gosh, Wendy… I can’t remember. I had to cut my zipper to fit my cushions. It was one of those long upholstery zippers–you can just cut it to fit your cushion. I am attempting to recover our pup cushions and I am feeling a little overwhelmed yet excited at the same time. I am trying to follow the design already on our cushions so that I can keep the slick, water repellent side and the zipper. Anyways, I realized that I am scratching my head at out how they only used 2 pieces of fabric after ripping apart the cushion cover. So I am going to follow your pattern a little more closely with a slight change to keep the water repellent side connected to the zipper on one side. We shall see. If you don’t mind me asking, how much was the materials to make the curtains and to cover the cushions? trying to decide if it would be more in expensive to just order the cushion covers. I don’t think it will be too awful expensive to make the curtains. I did have a question– Im pretty new to sewing but would still like to take on the project of reupholstering the cushions in our camper. I have a couple sewer friends who are willing to help too. When I did some brief looking online, it seems like outdoor fabric can be pretty expensive and we have both a dinette and a couch in our camper so there are 12 cushions total to fix up. I was planning on making a sample one just to get a feel for everything before I started like you suggested, but I have no idea how to calculate the proper yardage amount I will need! Do you have any tips on how to do that properly? I don’t want to spend money I don’t have to on way too much fabric. (I tend to overcompensate when Im nervous about things). Also, if you think Im totally nuts for trying to take that on as one of my first ever sewing projects, please let me know! help!! I am remodeling my 1983 Jamestown pup. it is one-sided, so I cannot find any other ones like it to get info. 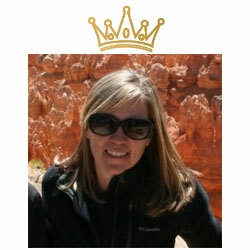 I am in the process of remodeling and I have been using your site like a bible! I totally messed up – I took out the 4 cushions and ripped the NASTY material off and threw it away, BUT I failed to write down how they go back into the benches, I have picked them up and rearranged them a dozen times. 2 of them are smaller with thicker wood and have little plastic “legs” on them. the other 2 are thinner wood, but bigger, what the heck are the 2 little legs for?? do they sit on something?? do you know?? Hey, Linda! It sounds like you are talking about the little plastic stoppers on the bottom cushion. This helps keep the cushion from sliding around. Do they look like these? yes – that is what they look like. since i bought the camper folded down with all cushions laying flat, i do not know how they actually ‘sit up.” like i said before, i have the little model that only opens on one side, so none of the other remodels on your site match mine. i have searched all over the internet for a diagram that i can actually read. the one i downloaded, from popup parts, has such bad photos, i can’t really see anything. sorry if i sound like i am whining!! i reupholstered 2 cushions last night so it is getting closer. painted inside of pup, tiled floor, and my neighbor built me a little cabinet because sink/stove one was missing. can’t wait to get it on the road. You say that you needed 7 yards of material. Was this for complete coverage of 1 fabric? How wide was the fabric you used? I’m thinking of a pattern for the front and back and a solid for sides of cushions. We have a 2003 Coleman Grand Tour Mesa. We have just brought a 1961 Bedford Bus. At present we are getting it road worthy, but after that we will start on the interior. Which has wrap around seats that turn into a hug bed. This needs recovering, I am going to try and wash the covers but as they may shrink they will have to be done. Thanks for posting such grate information it has given me more confidence to start the process. HELLO, I AM VERY IMPRESSED. MY HUSBAND AND I BOUGHT OUR FIRST POP UP CAMPER, USED OF COURSE. 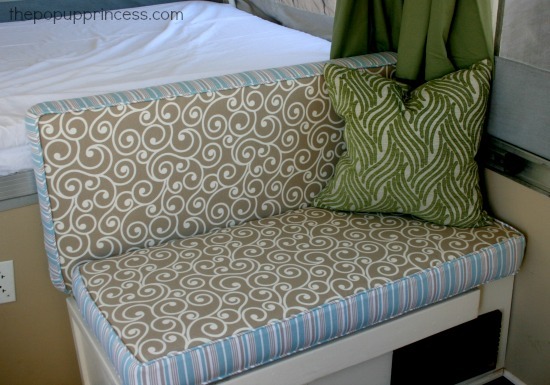 I WAS WONDERING DO YOU HAVE ANY EASIER IDEAS FOR REPLACING THE FABRIC ON THE CUSHIONS THAT DON’T REQUIRE SEWING? I AM NOT A GREAT SEWER…VELCRO? THANK YOU SO MUCH. Larissa, are you able to email me privately? Do you happen to do this for a fee for those of us who are not quite as crafty? We just bought a camper and I am recovering the cushions. The cushions have a smell and need to be replaced. Any suggestions on where to find more foam inserts for the cushions for inexpensive? I’ve found some but they are pricey. Thank you! I’ve discovered that foam is pricey no matter where you source it, Mary. You can use coupons at JoAnn and Hobby Lobby, but there again, it really adds up and can be pretty pricey. I think it might be a tad cheaper to buy a memory foam mattress on Amazon and cut it to specific sizes, though. It will really depend on how much foam you need. I thought I was going to reupholster my cushions using your sewing method. I figured that since I have the 2002 Coleman Santa Fe that our cushions would probably be similar. However, when I went to measure the cushions today, I noticed that I have an arc in my seat-back cushions. The middle measures 19 inches in length, and the ends measure about 16 inches. I can’t sew in a rectangle, or I will have huge gaps at the ends. Have you encountered this before? Should I staple the new material over the cushions? I thought about maybe stuffing the ends, so that it forms a rectangle, and then sewing cushion covers. I’m not sure what to do with the arc. Thanks! Erin made slipcovers for her Santa Fe (see here), and she has the kind of cushions you are describing. Can you alter the pattern to accommodate the curve? Or maybe remove the old cushion covers and use them as a pattern? I love your site! We just purchased a 2003 Viking PUP. And I’m wanting to reupholster or cushions. I found a you tube video from Sail rite that looks simple enough to follow.. I’m a noob at sewing cushions. Our bottom cushions will be a different fabric than our back cushions and I wanted to know how much fabric you purchased in all for your cushions. And also how do i calculate how many yards I need of each fabric?? I made new covers for my cushions and all was well for the first year, but now my boys are getting older (and there’s a dog now too) so I”m thinking of using some sort of vinyl cover that could be wiped off. Any ideas? Have you looked on Amazon? If you know the exact measurements, you can sometimes find hide-a-bed mattresses that fit certain camper styles. It is definitely worth a try, as all the options I have come across are MUCH more expensive. I’ve just bought a Jayco Swan and I absolutely HAVE to reupholster the seats on the dinette and club lounge (they are a horrendous brown and green plaid!!) 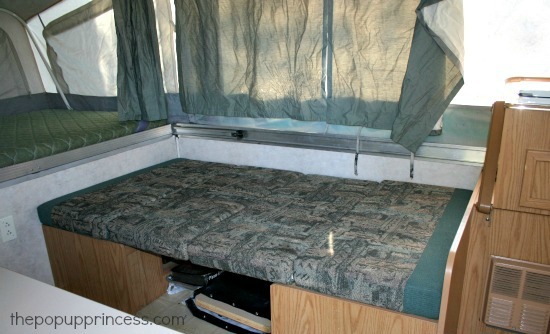 BUT I am at a loss as to how to start… the club lounge cushions (the back parts) are attached to the camper walls. I have no idea how to remove them, of if they even can be without causing damage… but that ugly fabric has to go! So PLEASE tell me someone can offer me some advice on this! I’d be so gratefull!! How did you handle the cushion stop buttons when making a slipcover. I’m running into issues or concerns when figuring out what to do here. Just cut holes in the cover? Nevermind. I see that you didn’t have any of the stoppers. Any suggestions would be appreciated though. Hello! I am new to pop up campers and my husband and I are purchasing our first one tonight! Of course, we want to “glamp” up our camper and both my spouse and I LOVE your website. Has anyone ever used mosquito netting for camper curtains? Our camper has darker panels that zip over the screens, and I was thinking a light, airy fabric might be something different. We’ve created mosquito netting curtains for a 2nd story sundeck space at our house and they wash like a dream and give the space a light, playful appearance. We have had our pup for about 9 months and I am just getting around to recovering the cushions… I too am intimidated and kept looking at the original fabric “well, it’s not so bad”… But the closer I looked, the more I realized they are pretty nasty. I scored some thick chevron upholstery fabric on Facebook marketplace for $20… So I spent yesterday taking the old covers apart to use them as my pattern… I am a novice seamstress and have never sewn anything more complex than a pillowcase. I have to keep telling myself “it’s just a camper” but now that I have ripped apart the old covers, there is no turning back!